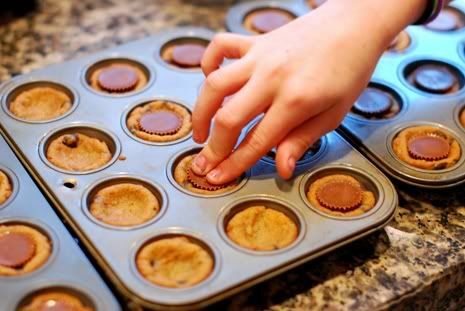 With only 2 ingredients, Chocolate Chip Peanut Butter Cups are a favorite treat in our house! Hello, fellow female. I'm glad we can ignore the boys and make cookies together today. 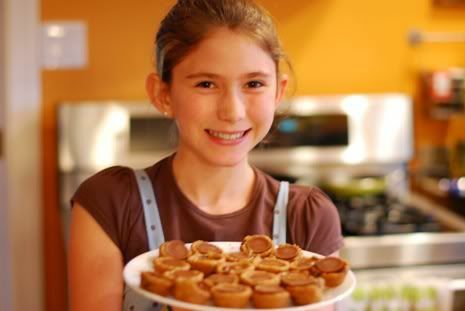 They are too busy playing video games to even notice that this recipe makes almost 3 dozen cookie cups. Between you and me, we'll just tell them that it only makes one dozen. Ready to see the magical duo? One tube chocolate chip cookie dough. One bag mini peanut butter cup candy. 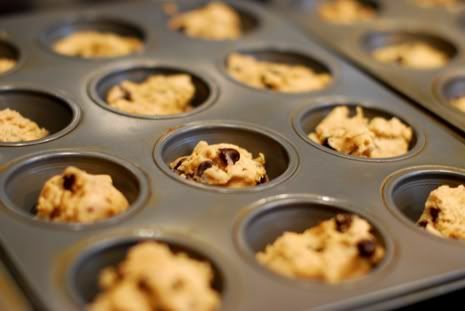 Divvy up the doughy goodness into greased mini muffin pans. Resist the urge to eat the raw dough. It is bad for you! Personally, I like to live on the edge. Bake in 350 degree oven until nice and golden. For us, that takes 11 minutes and 23 seconds. 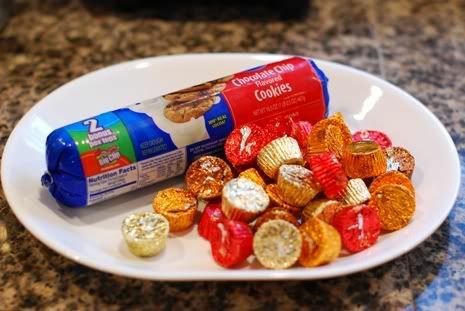 While you are waiting on the cookies to bake, unwrap one bag of mini peanut butter cups. 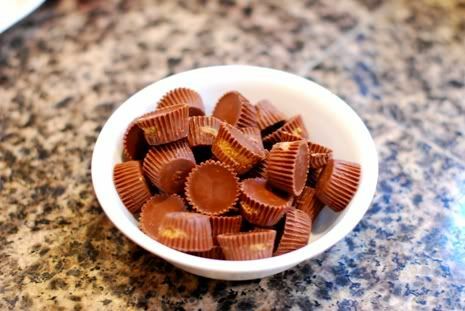 We throw budget out the window and go for the big dog of pb cups-- it's Reese's, baby! If you waited until 11 minutes and 24 seconds to remove the cookies from the oven, fret not. All is not lost. You have to listen very very closely to this part. Remove the cookies from the oven and IMMEDIATELY(!!!) push a pb cup right in the middle of the hot cookies! Let the cookies cool completely before removing. Since I have waited long enough by this step, I like to throw the pans in the freezer to move things along more quickly. Grease the bottoms of 3 mini muffin tins (a total of 3 dozen cups). 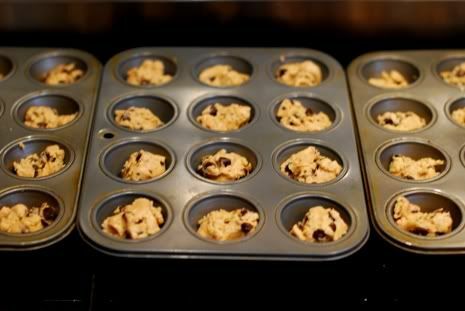 Fill each cup to 2/3 full with cookie dough. Bake for approximately 11 minutes, or until cookies are done. 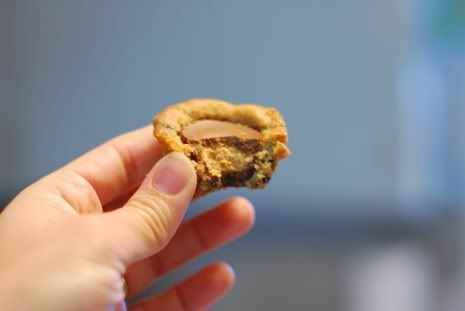 Remove from oven and immediately push one peanut butter cup into the center of each cookie. Eat up before everyone else figures out they are done! As for your cookie recipe, these look SO good! But I hold you responsible when I make these cookies and end up with five unwanted pounds because they are so delicious that I eat every last one them! Yummy! I can't wait to try those. My mouth is watering. Ok Marsha, those are ridiculously easy! Always a plus for a homeschooling mom, right? You know, I've seen these delicious little cookies at parties and ballet gatherings and thought how the heck do I make those. Now I know! Thanks! Oh yum! Those are the dangerous ones. You know, the ones that are so incredibly delicious and easy to make? Yeah. I'll have to try those sometime! My mother-in-law makes those too. A yummy treat! Did you come see my puppy yet?? ?